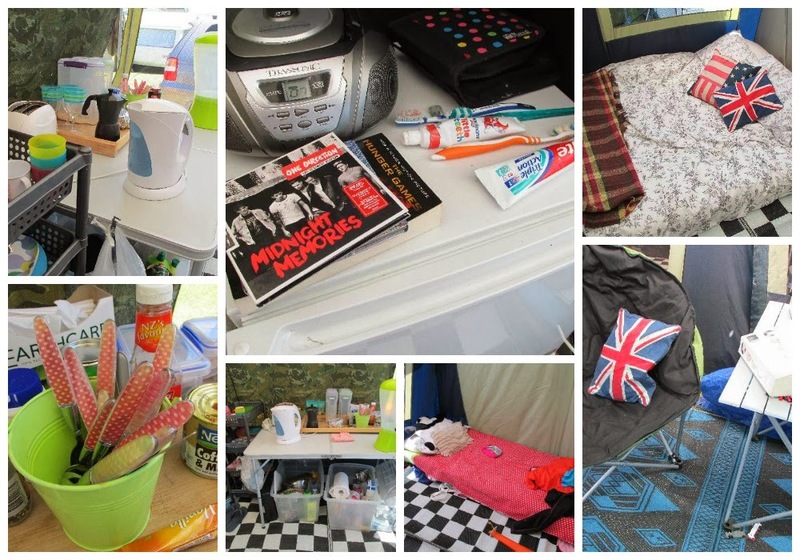 Great Fun etc: Camping... or Glamping? Camping isn't everybody's cup of tea, I know. But me? I have to admit that I rather love it. Of course I wouldn't have said the same thing back in the days when kids were young and sleepless, days and nights were endless and every waking moment was spent trying to keep your curious toddler from exploring the neighbours' tents / drowning in the sea / keeping the whole campground awake with their wailing. Oh no, camping was not my favourite thing back in those days. 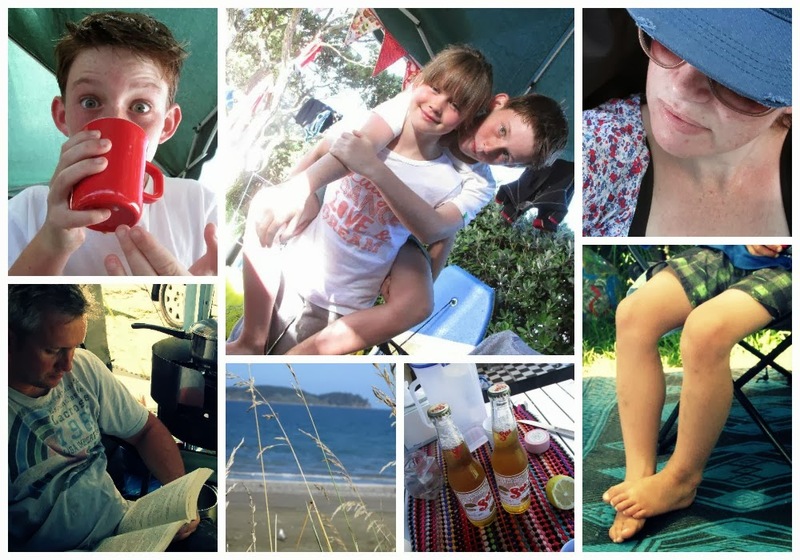 But now that our kids have grown to a sensible age and can be left to wander, play, make friends and swim a good ole Kiwi camping holiday can be very enjoyable. It helps that we have also learnt a few tricks to help make life under canvas nice and comfortable. I mean I wouldn't go as far as some people do but the days when cold water showers and long drop loos held any appeal are long gone. Getting back to nature and roughing it a little is one thing; sleeping for a week (with a bad back) on a 5mm thick bedroll with sand in your sleeping bag is quite another. 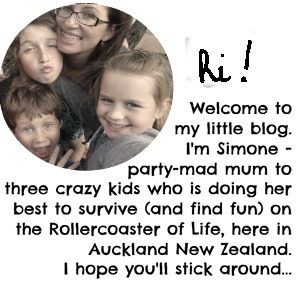 The campground we go to each year is great for families. It has a safe swimming beach, a games room and a couple of playgrounds, sparkling clean toilet blocks and kitchen facilities... and power. When we go camping we can take a mini fridge, a stereo, twinkle lights and an electric kettle. We line our floors with woven mats which filters the sand (around $20 from traders), we take the elephant foam mattress from our pull-out couch, camp stretchers, cushions and moon chairs. Some might call it "Glamping" - I call it comfy. 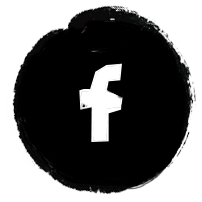 Glamping is having Sky TV in your caravan or backing up the furniture truck and unloading your bed from home and your 42" plasma. It's happens. (A friend of a friend saw the truck, witnessed unloading of the full sized fridge and couch into the tent - I kid you not). 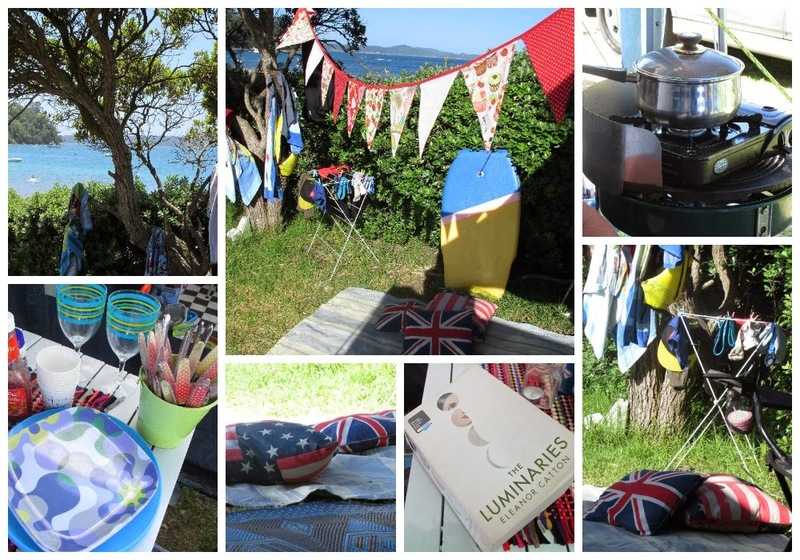 So while my bunting and cushions add style and prettiness to our week under canvas, and while the cider gets served chilled, I still like to wash the dishes in a bucket outside the tent and cook our food on the portable BBQ. Not once did I step foot inside the camp kitchen - that would be too much like normalcy. When I'm camping I like to know it. The beauty of camping when your kids are old enough and you find a great place to return to each year, is they way the kids can roam free like we did in the glory days of our Kiwi childhood. They make friends and swim all day, dig in the sand and play spotlight when it gets dark. Ipods are forgotten, memories are made and adventures had. Meanwhile mum and dad can alternate between reading in the shade and swimming in the sun. Kayaking, sipping a cold one with friends. There are no clocks, nothing scheduled. Lunchtime is when you're hungry, dinner time is when it's ready and bedtime is when it's too dark to see. 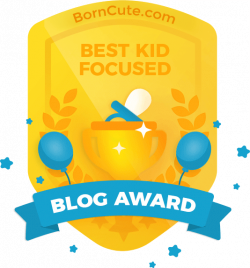 It was awesome to see Dash and his two buddies compete in the campground's annual kids beach tryathlon and witness just how far our boy has come with both his water confidence and his kayaking skills. Surely there is nothing more thrilling than watching your child compete and come away proud of his efforts? 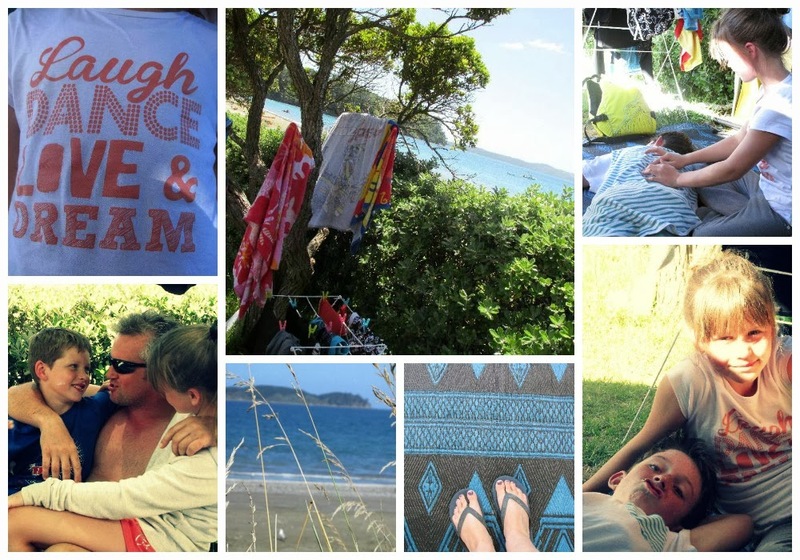 Just this weekend we returned to our favourite spot, an hour out of Auckland, to introduce Grandma from England to our little slice of Kiwi camping paradise. We hired an on-site caravan for the two nights (I still prefer tenting - see, I'm not really a glamper) and met up with our good friends who have a permanent site there. While we were sitting on the beach, just chillin, we realised that dolphins (dolphins!!!) had come into the bay. Eek! What a magical afternoon as this pod of five dolphins swam and played with any who could swim/kayak/jetski out to where they were. I was one of the the lucky ones who was able to swim all the way out, where I joined Mr G on his kayak and Dash and his pals on their boogie boards. For over an hour the dolphins teased and delighted us with their antics, coming almost close enough for me to touch. People pay hundreds of dollars to swim with the dolphins and here I was, a hands breadth away from them, four big dolphins and a baby who dived under us and swam around us and gave us an afternoon to remember. I guess when it comes down to it, it doesn't matter if you're glamping in a caravan, roughing it in a tent or something in between... as long as you're there beside the sea, enjoying summer with your family by the beach... and if you're lucky enough you might even get to be there when the dolphins turn up.